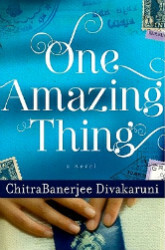 Like a string of pearls, in which each one is unique and exquisite when inspected up close, Chitra Banerjee Divakaruni’s new novel “One Amazing Thing” could even be a collection of touching short stories with a common thread, each one filled with detail and elegant prose. This novel regales the reader with tales of nine people who are trapped inside the visa office of the Indian Consulate in San Francisco, CA in the aftermath of an earthquake. How do people respond in times of panic, how do they deal with their uncertain future? One Amazing Thing reenacts the response of this small group in the time of crisis. When a powerful earthquake jolts the city, imprisoning the nine people inside the Indian Consulate, there is immediate shock and distress. However, when they find out that they are trapped inside this suite, the initial focus of this group is on food and water. As the already miniscule supplies slowly start to dwindle, the group looks for other avenues to ease their minds and souls. These nine people, all from different nationalities, cultures, walks of life, having been thrown together in an intimate and threatening environment, seek to allay their fears by talking about themselves. They each tell a story from their own life, the tale of “One Amazing Thing” that has shaped their characters and made them who they now are. Divakaruni’s character sketches are full of detail and precision. A wealthy couple whose relationship is on the rocks, a young Muslim-American man struggling with the consequences of 9/11, a graduate student tormented by a question about love, an African-American Vietnam Vet searching for deliverance, an elderly Chinese woman with a secret past, her teenage granddaughter, two Visa office workers from India who are on the verge of an adulterous office affair, and the graduate student who suggests that each of the nine people narrate an miraculous story from their life, these are the main characters in this novel. Each of their voices tells a unique and fascinating narrative, a story that drowns uncertainties, apprehensions, eases trepidation and softens anxieties. Chitra Banerjee Divakaruni is a gifted storyteller, whose novels are all very powerful and carry a strong voice. In this, her newest novel, “One Amazing Thing” she weaves nine stories into one, and with the help of her nine influential and powerful characters, she conveys the truth that a heartwarming story can be therapeutic, and has the potential to pacify.